To date the available records and old news articles confirm the following locations as Legion of Frontiersmen commands or detachments. Strengths are not known for most commands and detachments. DOMINION OF NEWFOUNDLAND, This Command is composed of Frontiersmen from St John’s, St. Anthony’s, Bonavista Bay, Battle Harbour, Nain, Hopedale, Grand River, Red Bay, Mud Lake. The known locations of Legion of Frontiersmen units across the Dominion of Canada and the Dominion of Newfoundland are identified with the date(s) of establishment, and where possible the individuals involved are mentioned. In some cases there are different dates of establishment reported by different sources. The earliest date is very likely the more accurate. References may be obtained from the author’s more detailed “Legion of Frontiersmen Timeline” for Canada or contact B.W. (Will) Shandro, Edmonton, Canada. Referenced critique and corrections are invited. 1905 – Montreal, Quebec. – Albert Dean Willcocks (or hyphenated Dean-Willcocks) the “Organiser for Canada” of Montreal begins his efforts with a letter to the RNWMP; however, no Montreal unit is noted until 1913. 1906–’07 (official date likely 1910) – Lac Ste. Anne, Alberta. – Stanley Winther Caws reportedly one of Canada’s first LF Commandants, forms a command in the frontier region at Lac Ste. Anne, Alberta. He is variously recorded as Caws, Cawes, and Caus. 1907 – Vancouver, British Columbia. – The first Canadian Command was formed at Vancouver BC prior to June 26, 1907. Although there are other reports claiming the first formation date, Vancouver is most likely the first Canadian Command. 1907 – Edmonton, Alberta. – J.V.E. Carpenter is noted as the Organizing Officer in Edmonton Alberta. Edmonton Command’s establishment date is not recorded. As well Strathcona (south side of Edmonton) is known to have had a separate Command in the Edmonton area. Other Organizing Officers were appointed for Lloydminster and Stettler; however, no records of LF units in these areas have been discovered to date. 1908 – Nicola Valley, British Columbia. – According to a small 16 page British Columbia Command handbook published 1974: “The Frontiersmen were first organized in British Columbia in 1908 in the Nicola Valley”. 1908 – Nelson, British Columbia. – July 01, Nelson BC Command records its first general meeting. 1909 – Whitehorse, Yukon Territory. 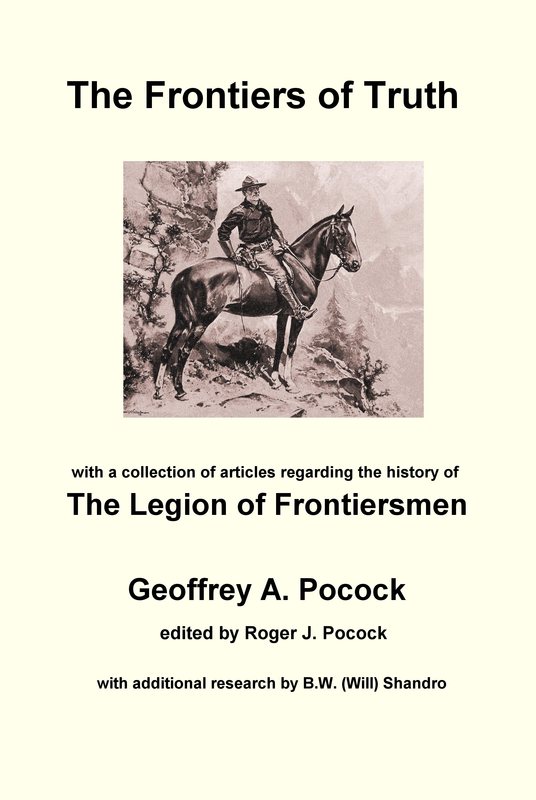 – In letters regarding Legion of Frontiersmen Camp No. 1 in “White Horse” (today spelled ‘Whitehorse’) Yukon Territory receives permission from the RNWMP to use the RNWMP “machine gun” for training. 1910 – Lac Ste. Anne, Alberta. – This Squadron, 35 miles west of Edmonton, formed about June 1910, squadron leader S.W. Caws (killed in action WW1), secretary D. M. Rourke, Troop No.1 led by N. Seton, Troop No.2 led by W. McLeod, Troop No.3 led by J. Yates, and Troop No.4 led by H. Appelle. 1910 – Vancouver, British Columbia. – According to a small 16 page handbook published in 1974, “The first Vancouver Squadron was formed in 1910”. 1911 – Vancouver, British Columbia. – Vancouver Squadron formed about May 1911, the dominant leader became Legion Capt. G.H. Sloan (killed in action WW1) who transferred from Hamilton Squadron as “extra Organising Officer”, with J. Miller as secretary. 1911 – Vernon, British Columbia. – Okanagan Squadron formed about April 1911, headquartered at Vernon BC and led by Legion Captain J.P. Audy (killed in action WW1), note correct name is Prosper John Theodore Audy. No. 1 Troop under command of Legion Lt. H.C. Verral is at Vernon with No.2 Troop listed as Nelson. 1911 – Saskatoon, Saskatchewan. – Established in 1911. HQ is located at Boulton’s Garage, 2nd Avenue North. Legion Captain Boulton commands. 1911 – Labrador and Newfoundland Command. – This command formed about April 1911 by A.W. Wakefield of Battle Harbour. It is reported that Wakefield is the Commandant (on active service WW1) and the secretary is F.E. Heath of Rigolet. The formal structure of this command is noted as: “A” Squadron St John’s leader E.W. Vere-Holloway (commanded LF gunners, St. John’s harbor WW1); No.1 & No.2 Troops responsible to Vere-Holoway with Troop No.3 leader Joseph Walters of St. Anthony’s, and Troop No.4 led by Mr Hutchins of Bonavista Bay. “B” Squadron leader was A.W. Wakefield of Battle Harbour, with No.5 Troop led by J. Ford of Nain, No.6 Troop led by T. Evans of Hopedale, No.7 Troop led by H.I. Paddon of Grand River, and No. 8 Troop led by H.B. Williams of Red Bay. 1911 – Hamilton, Ontario. – Hamilton Squadron formed about April 1911, leader A.T. Potts (on active service WW1), secretary D. Dodds. A 1914 photo identified some members as: C. Leadbeater, D. Dodd, T.H. Buckholder, D.S. Blackie, J. Anderson, W.H. May, W.Wood, A.J. Potts (Capt), J Ratcliffe. 1911 – Whitehorse, Yukon Territory – Whitehorse Troop is formed in 1911 and led by Legion Captain P. Jameson. (See 1909, a previous entry). 1912 – Carmacks, Yukon Territory – Yukon Camp No.1 Commandant is F. Harbottle. The location of Camp No.1 is at, Carmacks. (See 1910, a previous entry). 1912 – Dawson, Yukon Territory. Dawson Troop formed in about October 1912 and led by Legion Lieutenant A. Hart who later made his way from Dawson to England so that he could enlist with the 25th Royal (Frontiersmen) Fusiliers. (invalided WW1). 1912 – Mud Lake, Labrador troop of Frontiersmen pose for photo at the “present arms.” This photograph is available through the Northwest Territory Archives in Yellowknife. 1912 – St. John’s, Newfoundland. – “A branch of the Frontiersmen was established in St. John’s in 1912 by E.W. Vere-Holloway and was made up of ex-members of the boys brigades who qualified. A pre war total of over 150 made up the Newfoundland Command. 1912 – Chilliwack Valley sub-unit (troop) secretary J. Worral reports that the sub unit is invited by the local Militia Corps in to take part in a camp on Vancouver Island. 1912 – Calgary, Alberta. – This Command, formed about June 1912 by V.J.C. Eccles and Command Staff list included Col. G.E. Sanders CMG, DSO (on active service WW1); Lt.Col. P.J. Daly CMG, DSO (on active service WW1); Capt.V.J.C. Eccles (killed in action WW1), Lt.Col. J. Drummond. “A” Squadron leader is Legion Capt. J.C. Page (on active service WW1) with Troops No.1, No.2, No.3, No.4 led by Lieutenants Miller, Watson, Donalson, and Gilson respectively (all of whom are on active service WW1). “B” Squadron’s Troops No.5, No.6, No.7, No.8 are led by Lieutenants Lake, Emery, L’Amy, and Hogg respectively, (all of whom also on active service WW1). 1912 – Moose Jaw, Saskatchewan. – “A” Squadron Moose Jaw (later in South Saskatchewan Command by March 1913) was formed about December 1912, leader F.T. Flavell. 1913 – Chilliwack, British Columbia. – The Chilliwack Valley Troop was formed about January of 1913, the Organising Officer being H. Hastings.. (See 1912, a previous entry). 1913 – Toronto, Ontario. – The troop formed about February 1913, leader W.H. Slater (invalided WW1), secretary J.S. Warren. Two hundred and eighty (280) members of the Legion of Frontiersmen have enlisted with the 36th Peel Regiment for active service. They were to go overseas with the third contingent of the CEF. 1913 – Montreal, Quebec. – The troop formed about March 1913, leader C.H. Macnutt (on active service WW1). 1913 – Winnipeg, Manitoba. – Winnipeg Squadron formed about March 1913, leader E.C. Laver, adjutant M. Langfier, secretary E.C. King. 1913 – Moose Jaw, Saskatchewan. – Southern Saskatchewan Command formed about March of 1913, leader F.T. Flavell of Moose Jaw, Southern Saskatchewan Command Organizer. 1913 – Asquith, Saskatchewan. – “A” Squadron, North Saskatchewan Command, at Askwith (sic) 25 miles west of Saskatoon formed about June 1913, secretary T. Fairbrother. 1913 – Bengough, Saskatchewan, and Willow Bunch, Saskatchewan. – “B” Squadron, South Saskatchewan Command, at Willow Bunch and HQ at Bengough (75 miles south of Moose Jaw) formed about August 1913, led by A.L. Dove MC (on active service WW1), medical officer (Dr.?) Ireland. 1914 – Thunder Bay (formerly Port Arthur & Fort William) Ontario. – LoF activity not referenced / confirmed at this time. 1914 – Maple Creek, Saskatchewan. – “C” Squadron, South Saskatchewan Command, at Maple Creek (between Swift Current and Medicine Hat) was formed about January 1914, leader A.I. Dawes. 1914 – Medicine Hat, Alberta. – Medicine Hat Squadron, is formed about 1914, secretary E.D. Gower. Near the end of WW1, No. 920 in the Legion, Captain B. Oxley of Medicine Hat writes: “For two years I was acting commandant of the whole of Southern Alberta, a district larger than the South Island of New Zealand. I sent nearly 400 Legionaires [sic] into the first Canadian Expeditionary Force, and then I helped raise the 210th Frontiersmen Battalion, in which I was a major, and we trained at Camp Hughes. The badge of this regiment is the Legion badge. I was told, however, that owing to my age I could not be allowed to go to France, so I had to resign and see the regiment go without me.” [Southern Alberta Command HQ was Medicine Hat, Central Alberta Command HQ was Calgary, Northern Alberta Command HQ was Edmonton]. 1914 – Regina, Saskatchewan. – Establishment date is unknown; however, 50 men of the Regina Command of the Legion of Frontiersmen promptly made their way directly to London and meet with Lord Kitchener convincing him of their readiness for action. It would be four more weeks before the first Canadian contingent officially arrives in England on October 14. 1914 – Ottawa-Kingston, Ontario. A 1976 retrospective reference states that the history of Frontiersmen Units in the Ottawa –Kingston areas goes back to before the 1914-18 War. In 1914, a whole Troop joined the 4th Canadian Hussars (militia) – later to become part of the 8th Canadian Mounted Rifles overseas”. 1914 – Valcartier, Quebec. Regarding LdSH(RC). Regarding Lord Strathcona’s Horse, note the following retrospective quotation made in 1933: “In 1914 on the outbreak of the Great War, a contingent of the Canadian Command of the Legion joined Strathcona’s Horse and formed their own Legion Squadron distinguished from the other Squadrons by a distinctive flash”. For investigation – Is it possible that the reported surplus LF in Ottawa went to Strathcona’s Horse in Valcartier? -Note that the strength of the Lord Strathcona’s Horse in 1914 was 120 strong at the outbreak and they had to man up to strength in Valcartier. The war diaries on line only start around 14 Oct 1914 after they had been brought up to strength. 1914 – Ft. George, British Columbia. A reference to recruitment of a Legion of Frontiersmen in Fort George shortly after the 1914 Call-to-Arms is mentioned in a paper of a University of Northern British Columbia researcher. 1915 – Victoria, British Columbia. A home guard unit known as the VICTORIA VOLUNTEER MOUNTED RIFLES under the command of Lieutenant John Briant Howes formally transferred all rank and file into the Victoria Legion of Frontiersmen. 1916 – Alberta Rural Communities. The UNITED FARMERS OF ALBERTA MOUNTED INFANTRY CORPS is recruited by the Legion of Frontiersmen to provide mounted rifles in Edmonton and in outlying areas around the City of Edmonton. (Horse Hills, Belmont Park, Clearwater, Winterburn, Spruce Grove, Stoney Plain, Leduc, Bremner, Clover Bar). 1917 – Edmonton, Alberta. “The formation of the Edmonton Battalion Reserve Militia was absolutely necessary in order to give governmental sanction to the Legion of Frontiersmen that they might complete their usefulness…to train men who had to stay at home to be of service in case of trouble arising. By being a body of trained men it frees more men of military age and fitness for actual overseas service. There is no use in loyal citizens saying that when trouble comes he will be there, because without training he would be of no earthly use”. P.C.H. Primrose, Officer Commanding, Edmonton Battalion Reserve Militia. (RNWMP Superintendent, LOF Commandant, Police Court Magistrate, later Lieutenant Governor of Alberta). 1917 – Moose Jaw, Saskatchewan. On 16 March 1917 the King’s Colours were presented to the 210th FRONTIERSMEN BATTALION C.E.F. by Lady Lake, wife of Saskatchewan’s Lieutenant Governor Sir Richard Lake. Similarly, Mrs. Seaborn wife of the Commanding Officer of the 210th Frontiersmen, presented the Regimental Colours. The author believes that other Commands were started in Canada on or before 1914; however, they are yet to be found in some file or within the text of century old newspapers. It is believed that other Commands were started in Canada on or before 1918; however, they are yet to be found in obscure files or within the text of century old newspapers.